Many of us experience colds, cough or flu during the winter months, but a new study in Therapeutic Advances in Respiratory Disease, finds that probiotics—health-promoting bacteria—may help prevent winter illness in children. Probiotics are living microorganisms or “healthy” bacteria that may help balance normal intestinal bacteria, regulate various bodily functions, and enhance a person’s health. In fact, research has shown that probiotics such as lactic acid–producing bacteria may help prevent infection, reduce inflammation, and improve digestion. This study looked at the effect of probiotics on winter illness in children and randomly assigned 135 children, ages 3 to 7 years, to receive a placebo or a daily supplement (Lactobacillus helveticus R0052, Bifidobacterium infantis R0033, Bifidobacterium bifidum R0071, and fructooligosaccharides) for three months. The participants had experienced at least three episodes of ear, nose and throat, respiratory, or gastrointestinal illness during the previous winter. A health event—the majority being a respiratory or ear, nose and throat, or gastrointestinal illness—occurred in 50% of the probiotic group and 67% of the placebo group. Children who received the probiotics had a 25% lower risk of being sick compared with the placebo group. Fewer children in the probiotics group missed school compared with the placebo group (26% vs. 43%, respectively). “Lactic acid bacteria and bifidobacteria are increasingly being administered to infants with the intention of improving health and, in effect, probiotic therapies are entering the therapeutic mainstream of pediatric disease,” said Mario Cazzola, MD, lead author of the study. Further research is needed on the important topic of probiotics and health. Parents should always check with a knowledgeable pediatrician or other healthcare professional before giving their children probiotics. Eat right. Winter is the season for celebrations and holiday fare which means a significant increase in the availability of high-fat and high-sugar foods. Set a limit on the amount of holiday cookies and sweets you and your children consume, and keep healthy snacks readily available at home. Consider staying home if you are sick. When you or your children are ill don’t expose other people to infection. Stay home from work or school, and take care of yourself and your child. Exercise regularly. Exercise may not come as naturally during the winter months, but it is just as important to find creative outlets for keeping up the same level of activity you have enjoyed during the summer. 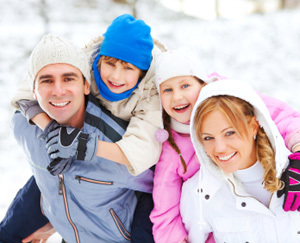 Stave off extra holiday pounds and keep children healthy by being active on a daily basis.